Abstract: Spider orb-web dimensions provide important information about the age, species, physiology and behavior of their builders. Although webs are delicate and difficult to see, on-site photographs may be taken which render webs as high-contrast li»s against clear background. Required equipment is portable, may be used in bright sunlight, and webs are not damaged by this method. Many investigations have been made possible because theNfwo-dimensional spider orb web lends itself so well to> photography Bp the laboratory. As a prey-catching and communication dewce^Re orb-web structure represents a survival strategy, but as a record of behavior the orb reflects a complex set of||oordinated movements which orb-weaving spiders may perform daily throughout their life. 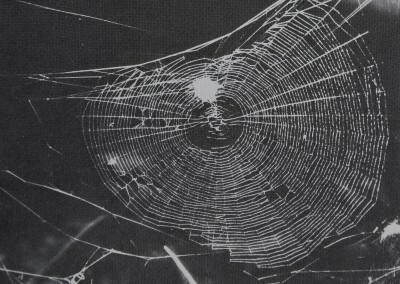 In its component dimensions, the two-dimensional, geometric orb web dramatically shows the effects of stressBupon its builder. 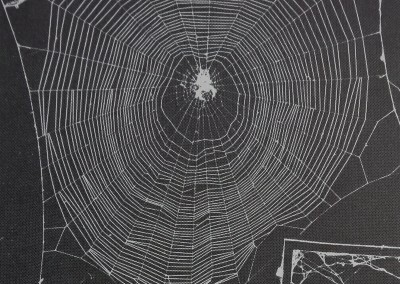 Food deprivation, the administration of different drugs and alteration of spider morphology all produce characteristic, analyzable changes in such web features as web diameter, number of radii, mesh width, spiral thread length, web symmetry, total thread length and others (Witt et 1968). 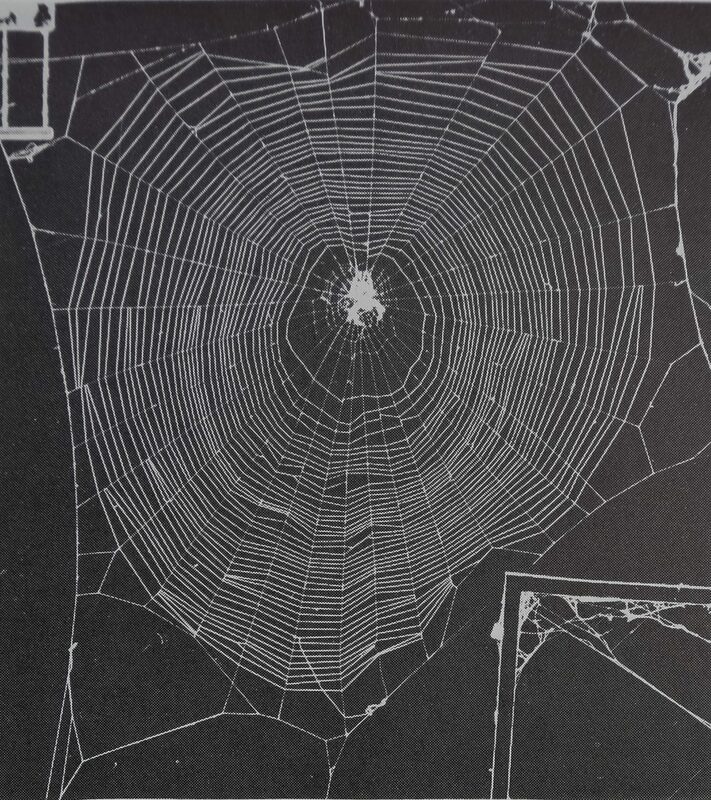 Moreover, coded into the orb web is specific information about its builder; for example, general web structure gives clues to spider species, size variation suggests spider maturity, mesh size identifies dimensions of preferred prey, and so on (McCook, 1889; Peters, 1969, Witt et al, 1972). These and other web studies have much potential value for field research since orb webs are found everywhere and provide a quantitative measure of important spider conditions. Unfortunately, obtaining web dimensions in the field is difficult. George Uetz (pers. comm.) has studied predator strategy and niches by measuring webs directly with fine calipers, but this is time-consuming and limits the amount of data which can be collected. A researcher can measure web diameters, or count numbers of radii with little difficulty, but it is impossible to- estimate the importance of more complex web parameters at the time of data collection. stays available for réévaluation or experimental replication. Unfortunately, even under the best conditions spider silk is thin and difficult either to see or photograph. An early solution was to coat webs with ammonia chloride smoke and photograph with large format negatives (Peters et al., 1950). 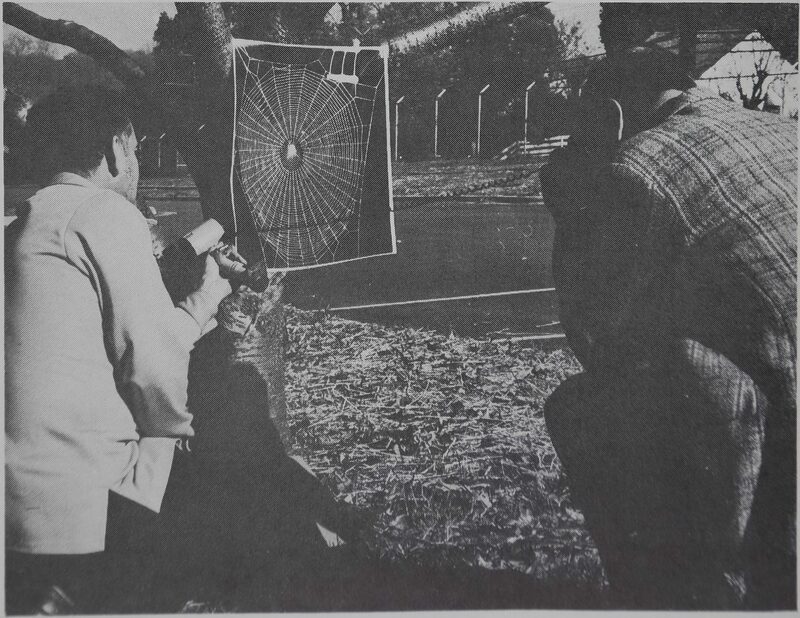 Later improvements in film emulsions allowed the use of economical 35-mm film for pictures of webs sprayed with glossy white spray paint (Witt et aL, 1968). Eberhard (1975) has utilized cornstarch dusting for web visibility. However, spray paint and dust weigh down threads, distorting the webs for analysis, and rendering them unsuitable for the spider to use, reingest or rebuild. 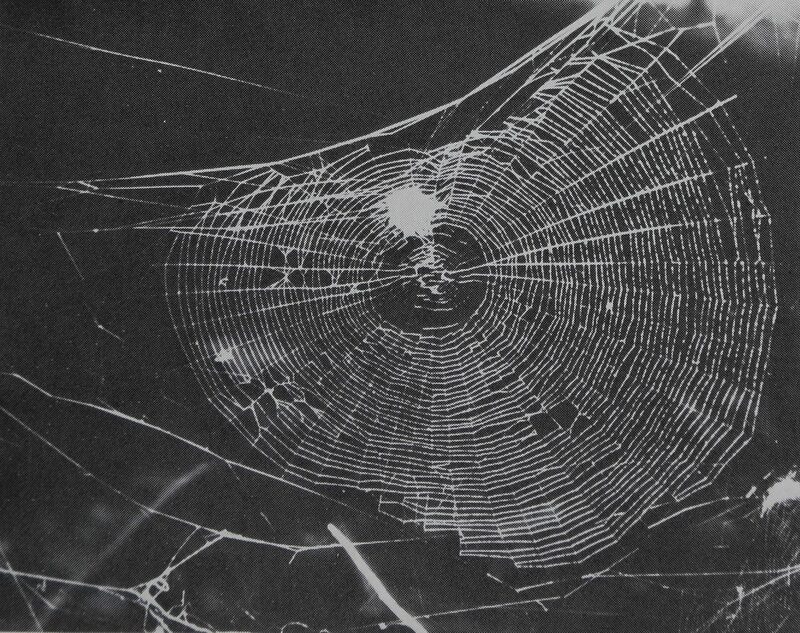 By using high-contrast lighting, it is now possible to take good web photographs using normal, unsprayed webs, if spiders are allowed to build in aluminum frames (Fig. IA) (Langer and Eberhard, 1969; Witt, 1971). This allows the spider to catch prey on the web and eventually eat it, as would occur in nature. A ring of fluorescent lights in front of a black box surrounds the frame and the picture is taken through a movable viewing screen in a darkened room. Various film types may be used, but photo quality improves noticeably when apparatus and even room walls are painted flat black (M. Scarboro, pers. comm.). Obvious^, such a technique Rf|mited to use mlaboratory. We present here a method which yields analyzable web photographs suitable for publication, showing orb-web threads as clear lines against a relatively featureless black background (Fig. IB). The method uses only lightweight, commonly available equipment run by batteries. All steps may be carried out in the field in a short time, including film development. The web is left intact and Unchanged, and sfàys available for collection or later observation. This equipment is sufficient to produce publication quality web photos: (1) a 35-mm single-lens reflex’Camera (such as Nikon, Pentax or Olympus) with a high-quality, close-focusing||ens or extension tubes; (2) a hand-held exposure meter capable of measuring light levels where webs are found; (3) a wide-angle coverageHbattery-powerÿd electronic flash such as the Honeywell Strobonar 770; (4$ high^eontrast film* such as Kodak 135 high-contrast copy film(5) a Kodak *neutral’grey card; (6) a lightproof photo changing bag; (7) a lightproof |5-mm developing tank; (9) Kodak Tri-Chem Pack and two 8-oz chemical solution bottles. In photographing for high contrast, priririfples are observed different from usual photography. To obtain contrast we control lighting and exposure. Artificial lighting is supplied by electronic flash for high-power and wide-flash coverage. The 18% neutral grey card is held in the same overhead light which illuminates the web. The light meter (set nominally at 64 for Kodak high-contrast copy film) is held 0.5 ft away to measure only light reflected from the card. Set in the manual operating mode, the flash will have a fixed duration, often 1/1000 sec or less. This speed is noted on the meter scale for subsequent determination of lens aperture. By setting the aperture the meter indicates at this speed, the electronic flash will yield a snapshot-type picture, with background visible as a uniform grey. However, for purposes of web analysis we want the web brightly visible, the background rendered completely black. From tests with film emulsions, it has been shown that from neutral grey to the blackest shadow is no more than 4 f-stops, so if the camera lens is closed down 4 f-stops from the meter reading of the neutral grey card at the electronic flash speed, the background will be black on a photograph (for details on the Zone System, see White, 1968). illumination stays the same. The camera shutter is set to synchronize with electronic flash (usually 1/60 sec) and the flash sync cord attached. 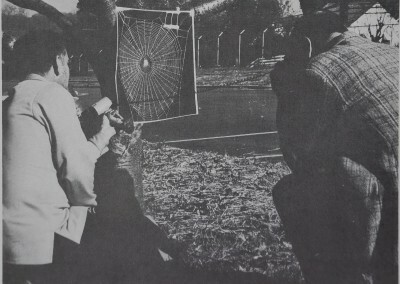 Any scale marker (such as white tape with identification codes) placed in the plane of the web would also be lighted and would be visible in the photography. Alternatively, magnification ratio il shown on many macrolenses and may be noted and used instead of a scale marker in later projecting the web for analysis. The projected image will be distortion-free if a modern design, high-quality, close-focusing lens is employed and held at right angles to the plane of the orb. The exposed film may wait for later development, but immediate processing allows the researcher to check final photographic quality. Film ils loaded into a light-tight developing tank using a photographic changing bag. The Kodak Tri-Chem Pack provides sufficient chemicals for several rolls of film, specially made to mix instantly before processing in 8-oz bottles. After loading film the tank is closed, brought into normal light and filled with Dektol Developer for 8 min. Times given are with gentle shaking agitation 10 sec every minute, and with solutions || room temperature. Hot or cool solutions should not be used. Dektol is then returned to bottle and film either washed in running water or in a stop-bath solution for 30 sec with constant agitation. The tank is again drained and refilled with Universal Fixer for 5 min, agitating 10 sec per minute. The tank may now be opened to light, and washed in running water for 20 min or retained in a fresh water bath for later washing. Note that these directions are different from those supplied with film or developer and will give optimum web photographs under a wide range of conditions. The complexity of earlier methods and the bulk of needed equipment make them unsuitable for field use. Hopefully, with a practical method of outdoor web photography, webs can be analyzed from nature as they are now from webs spun in the laboratory. Natural stresses such as starvation and water deprivation or environmental pollution could be examined and compared with similar stresses artificially produced. Such analysis could facilitate present studies on predation, growth and energy flow, and also provide behavioral information about interactions between and within a species. Even the study of characteristic and variant webs between species could facilitate taxonomic investigations of building behavior through simplft web photography. This method is particularly designed for two-dimensional orb webs which are built by many species. Where webs extend into the third dimension (t-£§§Theridiid Space webs or auxiliary barrier webs ), these threads will be rendered in profil^ but could be used for comparative studies. We are now developing another method specifically to record these three-dimensional web parts. Acknowledgments.^I gratefully acknowledge the support of the National Science Foundation for Grant No. BMS 75-0091 to Peter Witt and that of the North Carolina Foundation for Mental Health Research, Inc., for a travel grant. Very sincere thanks are expressed to Dr. Peter Witt and Rubenia Daniels. I would also like to thank my father, Mr. Wei Burgess, for his constant encouragement during this and all other times. Eberhard, W. G. 1975. The “inverted^ladder” orb web of Scoloderus tuber-culifer and the intermediate orb of Eustala. J. Nat. Hist., 9:93-106. Langer, R. and W. G. Eberhard. 1969. Laboratory photography of spider silk. McCook, H. C. 1889. American spiders and their spinningwork. Vol. 1. Snares and nests (publ. by the author). Acad. Nat. Sciences, Philadelphia. 372 p.
Peters, H. M. 1969. Maturation and coordination of web-building activity. Am. Zool., 9:223-227. Spinnen durch neurotrope Substanzen. Z. vgl. Physiol., 32:29-44. White, M. 1968. Zone system manual. Morgan and Morgan, New York, 112 p. Witt, P. N. 1971. Instructions for working with web building spiders in the laboratory. BioScience, 21:23-25. —, C. F. Reed and D. B. Peakall. 1968. A spider’s web. Problems in regulatory biology. Springer, Berlin. 107 p.
behavior in two orbweaving spiders. Am. Zool., 12:445-454. J. W. Burgess, North Carolina Mental Health Research Section, P.O. Box 7532, Raleigh 27611. Submitted 17 May 1976; accepted 21 June 1976. The American Midland Naturalist is published quarterly by the University of Notre Dame, Notre Dame, ^Indiana. It is wholly owned by the University. The Acting Editor is Ralph E. Thorson. The total number of copies printed is 1,550, subscriptions are 1,180, exchanges 166 and free distribution is 33.